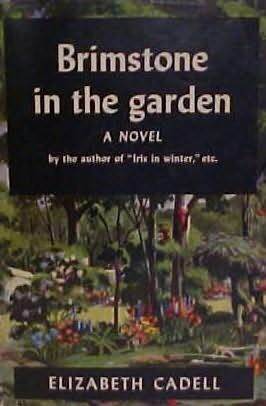 It is hard for me to pick THE one book that made me want to be a writer, though like Monette Michaels, Mary Stewart played a large part in my love for, and my desire to write, romantic suspense. Not exactly a grabber, but books sometimes started slow back in the day, and readers were okay with that. Like that opening line, the story started as a trickle but achieved excellent flow. Nowadays, readers are a lot tougher on slow starts. I’m glad I stuck with it, though. Otherwise I would never have “met” Cousin Clarry. There’s more, much more to learn about Cousin Clarry and the denizens of Deepwood. They felt real to me then and yeah, they still do. Somewhere Aunt Clarry still lives. I’ve reread the book many times (it is one of my comfort reads) and learned some important things about being a writer from the sheer craft displayed in this book. First, characters matter. I know that’s a duh, oh-so-obvious point, but I have many times studied the seemingly effortless way Cadell brought her characters to life, looking for clues to how she managed it. Many of those techniques shouldn’t work with todays’ readers…and yet…when Cadell used telling, instead of showing, I never noticed until I went back to study her work. She made telling fun. She made showing fun. I always had the feeling that she chuckled while she typed. For my own writing, if I’m not getting a kick out of a characters—even my bad guys—then they get kicked to the curb. Why would the reader enjoy something I’m not? The other thing I learned from her—and this goes against current marketing wisdom—was to follow my Muse to the stories. Cadell wrote what is loosely called “women’s fiction,” but her books wander widely between “simple” romances, gentle mysteries, and stuff I don’t think there is a genre label for them. One of her books is a journal, another told from a child’s point of view that is not a middle grade book. As a reader, I followed where she led because I loved her writing. I loved the way she used words. I loved her characters and her quirky plots. 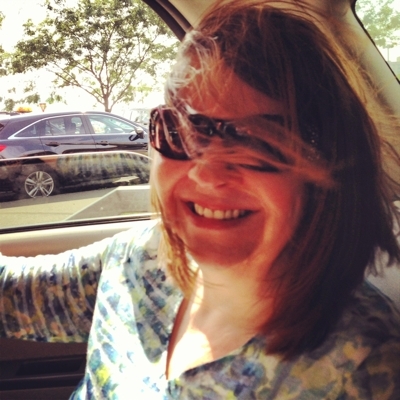 I was willing to go where her Muse took her and be grateful for the ride. The lady could tell a story. I wanted to be “a lady who can tell a story,” but in my way, not hers. As an author, I’ve tried to be true to her standard and true to myself. My books wander the genres like the T-Rex did in Jurrasic Park when the power went off. And though I try not to chomp things, I keep the stakes high. My goal is to deliver to the reader an adventure that only I could write. Maybe, just maybe, some new writer fifty years from now (ouch!) will be inspired to become an author because of something I wrote. Hey, I’m an author. I can dream. 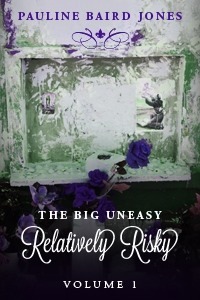 Pauline released her 13th novel, Relatively Risky, in 2013. She’s not superstitious about it, well, maybe a little. She’ll be glad when #14 is officially out. But the whole loving/killing thing that needs to be done? Doing it fictionally is just better for everyone. And particularly for Pauline, who hates the thought of getting strip searched and jailed. ~ by Monette Michaels on April 30, 2014.